11.5 Outdated packages? Debian Upgrade? 11.5.1 I want to do it anyway!!! 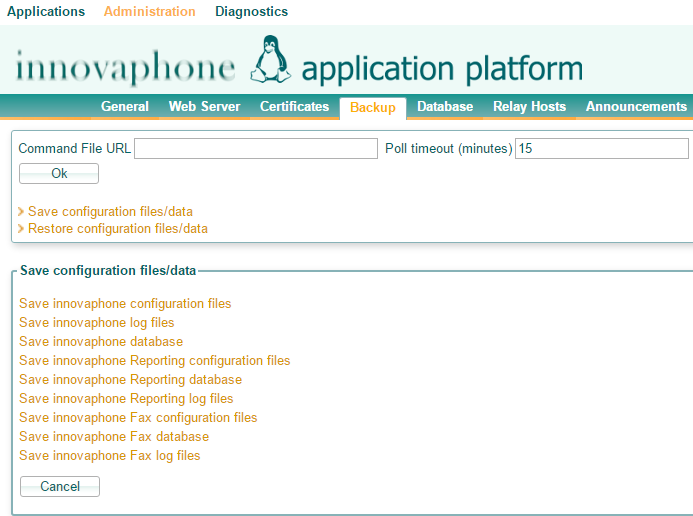 The innovaphone Linux Application Platform permits to install innovaphone or custom applications for certain purposes, like Reporting or a Fax Server. It also allows to backup/restore configuration files, uninstall applications or see and backup logs. The architecture of the platform is armel. Download the latest Linux Application Platform from download.innovaphone.com . It is strongly recommended that you try to precalculate the needed disk space and that you choose a suiting disk size. All in all about 1.3 GB are already in use after the initial installation. All in all about 1.6 GB are already in use after the initial installation. It is recommended to use CF-Cards with sizes of 8GB or more and the card must support UDMA! Enable Linux under Linux General. Be sure that "Autostart Linux" is disabled until the installation process is finished. Decompress the downloaded package. You should have an image file like linux_ipxx10_armel.img now. This works for both IPxx10 and IPx11 hardware! 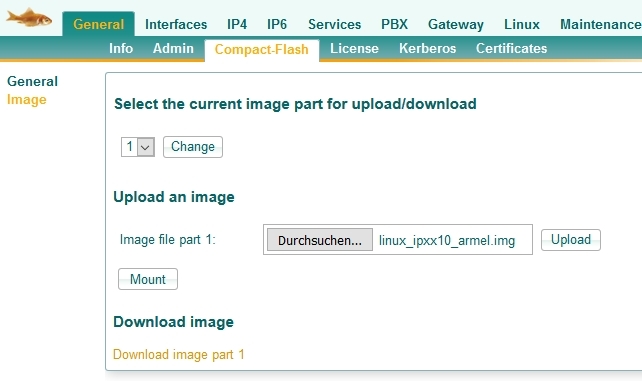 Upload the decompressed file over the gateways web interface under Reference10:General/Compact-Flash/Image (IPxx10) or Reference12:General/SSD/Image (IPx11). Unmount the CF card/SSD if necessary. Select "Part 1" before starting the upload! Reset the box (which also activates the config change of step 1). Configure IP under Reference10:Linux/IP : select either "Disabled" to assign a static IP or ETH0/ETH1 to receive an IP-Address from DHCP-Server behind ETH0 or ETH1. Configure root=/dev/sda2 under Reference10:Linux/General Kernel command line. If you want, configure the autostart flag. Click the Reference10:Linux/General Start-Link. The page refreshes until Linux gets an IP and then tries to get a link to the Linux Web Server, which can take some time for the first time installation (~ 5 minutes to 2 hours, for a IP411 ~15 minutes). Open the Linux Web Server to see the installation progress (which might take several minutes too). The default credentials are admin/linux for both platforms. The output of the installation log is stored on the Linux AP under /var/log/init_install.log. In case you have no access to the web server but a console or SSH access, you can check the installation progress in this log file. E.g. login to the console with root/iplinux and run follwong command: more /var/log/init_install.log. In case you have an SSH connection to the Linux AP, you can download this file using WinSCP tool. 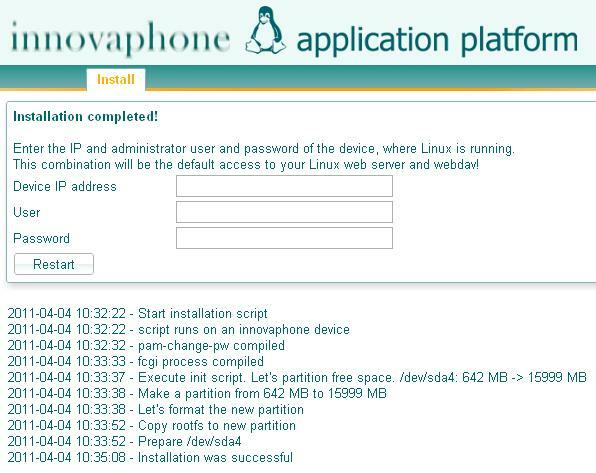 Enter the innovaphone device IP address (optional port allowed) and admin credentials when the installation has finished. Now wait until the page refrehses. 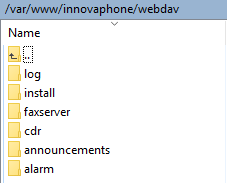 The web server credentials are now the innovaphone device admin credentials, e.g. admin/ip6010. If the device couldn't be reconfigured, you will get an error message Command line at the PBX could not be changed... In this case, you have to open Reference10:Linux/General on your device, click stop and enter root=/dev/sda4 under Kernel command line. Then start again. Your Linux webserver credentials will be admin/linux in this case. You will see now root=/dev/sda4 under Reference10:Linux/General since Linux is running in on the fourth partition. You shouldn't change that unless you want to install Linux again. Decompress the downloaded archive. You should have two files: IP-Debian.vmx and IP-Debian.vmdk. Do not directly start/doubleclick the vmx file! Start the VMware Player and Open the vmx file with Open a Virtual Machine. Open Edit virtual machine settings. Select the hard disk and Expand it under Utilities to the wished size. Apply the change and klick Play virtual machine. If 8 GB are enough, simply double click the vmx file and Linux will start. The first time, a script will automatically configure a new partition, the web server etc., which will take some time. The waiting time depends on the CPU of the computer running the vmware player. In some cases the waiting time can be up to 30 minutes, in most cases the installation finishes in about 2-5 minutes. In the meantime, fetch your IP from the VMWare Player screen or login as root and get your IP address with the command ifconfig. Login to the web server to see the installation progress (it may take some minutes until the web server is up). Linux will restart automatically after the first time installation has finished. If you have already installed the latest version of the Linux Application Platform, simply download the Linux...HotfixIncremental for your platform (VM or IPxx10/IPx11) or if you have missed some hotfixes, download the Linux...HotfixCumulative archive, which contains all hotfixes since hotfix1. You might get a PHP error when the browser is refreshing during the installation. Just refresh (F5) the page and you'll get the installation progress again. For instructions how to upgrade from a previous major release (such as V9 to V10), see Upgrading Linux Application Platform in Firmware Upgrade V9 V10. On an IPxx10/IPxx11: assign a static IP under Reference10:Linux/IP, this will do an internal DHCP response to the Linux that's running as DHCP client mode. On a VMWare: assign a static IP in your local DHCP server for your MAC address defined in the *.vmx file or configure a static IP address under Configure IP . When running Linux on an innovaphone device IPxx10/IPxx11 there is no dedicated network interface for the Linux machine. Instead we have a special transit network between the Linux and the device. The Linux will always operate as DHCP Client mode. Any ARP request done by the Linux machine will always get the same ARP result that will be the internal "NIC" inside the device, so all packets are always sent to the same IPxx10/IPxx11 device that works as a router. When the packet sent by the Linux machine arrives the innovaphone device, it will follow the IP routing table of the device itself. In case we have a single network (voice) we will have no problem since the default gateway is just one. However, if we wish to split into two networks (voice and data) and the Linux machine should have a different default gateway, this has no effect since IP routing is based on the innovaphone device IP routing table, because we can't have two default gateways at the same time. The IP configuration on the Linux Application Platform is only available on a VM! 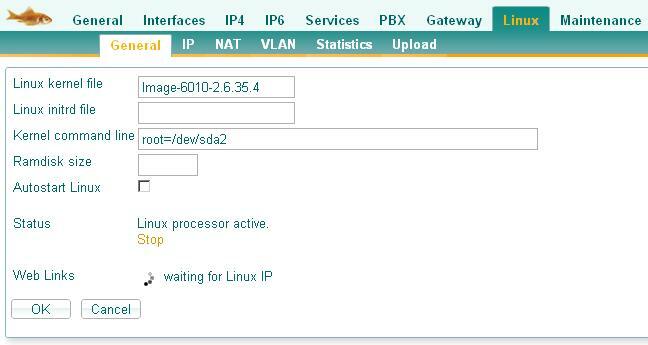 A static IP for a Linux Application Platform for an IPxx10/IPxx11 can be configured on your gateway under Linux/IP. The optional parameters in  can be only configured, if Static is selected as mode. Here you can change the credentials of the Linux root user. Configure credentials for authenticated URLs. These credentials will be used in automatic backups. You can add/remove Urls with the + and - at the right side of the list. Default is Europe/Berlin but you can change that to a valid timezone (an error is given if timezone not present). If innovaphone Reporting is installed, you can configure another password for the postgres admin user. We use lighttpd version 1.4.32. The linux web server user is www-data and group user also www-data. Root directory for the web-server is /var/www/innovaphone. This information is mainly relevant if you plan to develope custom applications and integrate them into linux application platform. These paths are by default readonly. You can set the 'Write' flag to make the path also writable. This flag will be anyway ignored if credentials are provided. <IPadr>/webdav/ is the root directory for webdav files. If you want to access a directory/file without credentials you have to add this directory to the Public Webdav Paths. Example: /webdav/background/ Here you have the background pictures for your Phones. Now you have a public access to the folder background. Enter a single '/' for a public root directory. All sub directories and files will be also public then. If you enter e.g. '/update/', the directory 'update' and all sub directories/files will be public. If you enter e.g. '/update', only the directory 'update' and its files will be public. Important: Linux file names are case sensitive (so /Update is not equal /update)!. Here you can change the credentials for Web Server access. Here you can change the credentials for webdav access. If you have installed an application, which has the lighttpd-auth property set in its configuration file, you can configure a separate user/password for the applications web site. If you want to disable the separate authentication, leave the user field empty and enter the currently configured password. The authentication will be the same as the root web server authentication afterwards. One can just login on the application web site with this access. A configured access overrides a configured public web path to '/apps/application-name'! If you need mutual TLS for innovaphone devices with a certificate signed by innovaphone, you can activate mutual TLS for a configurable port. Currently we're just supporting client certificates signed by innovaphone's innovaphone Device Certification Authority. The physical mutual TLS path is /var/www/innovaphone/mtls. Here you can put your script files, e.g. mtls.php. You then call this script file by https://linux-ip:mtls-port/mtls.php, as this path is the document root for the configured port. Using a webdav client (like NetDrive) upload the script to the webdav folder. Afterwards connect with Putty to the linux. The current server certificate installed on the web server is shown here. A self signed certificate, innovaphone-linux, is installed by default. It is recommended to change it with your own certificate. It is also possible to trust or reject other certificates. Note: Currently the LAP doesn't support the upload of a password protected certificate. As a workaround it is possible to convert the certificate with OpenSSL (on windows or Linux) to PEM format without password and upload this one. With the following openssl command, the password protected certificate can be changed into an unprotected certificate. The unprotected certificate should be deleted directly after upload for security reasons. Add -nodes if you don't want to protect your private key with a passphrase. You now will be asked for certificate information. The file key.pem can now be uploaded via the web interface of the Linux AP. The web server can be configured to poll a Command File URL (on a web server). The backup process is similar to Reference10:Services/Update. An alarm server can be also configured to receive alarms during an automatic backup: Alarm Server under Diagnostics . At the bottom you will see a list of the current automatic backup serials from the Command File URL and the log of the last automatic backups. Saves all neccessary configuration files (no application specific files) as a tar gz archive (so you should use .tar.gz as ending). Saves all available (also application related) log files as a tar gz archive (so you should use .tar.gz as ending). Executes the following command(s) only, if the specified time matches and only once per hour (independent of poll timeout value). # commands only from monday till saturday at 10am and 11am executed. # commands only Saturdays and Sundays at 00am executed. day goes from 1 (Monday) to 7 (Sunday). hour goes from 00 to 23. You can specify multiple times commands to override the last one. Open this link to see all available files/data/logs to download them manually. Password files for web server authentication won't be saved! Open this link to restore all available files/data. Password files for web server authentication won't be restored! The Application Platform contains a mail client which speaks SMTP. The SMTP daemon (postfix) looks up by default the DNS MX record of the recipient email address. Relay SMTP hosts can also be configured to deliver the mails. Each relay host is related to a sender mail address or a sender mail domain. TLS is used if the host supports it. The form [hostname] turns off MX lookups. See also the postfix documentation. If anonymous SMTP is to be used, user and password must be left empty. Note: Important to use "" like the picture. Currently innovaphone Reporting and innovaphone Faxserver are using these relay hosts, if entered. The innovaphone database is created to store e.g. relay hosts. PostgreSQL is also available for other applications and any of them could create its own database. The database user is innovaphone with default password innovaphone. This password may be changed here. You can upload a 16bit,8khz,mono wave file, which will be converted to G711U/G711A/G723/G729 . If you check the Return files as ZIP file flag, you will get a ZIP file, which contains the converted files. These files are not stored locally then! For the new Codec G722, OPUS-NB and OPUS-WB you have to use the online converter available on my.innovaphone portal (login necessary first): https://my.innovaphone.com/support.php or on our website https://www.innovaphone.com/en/support/convert.html. No Conversion of new codecs is possible with Linux AP ! A list of all currently installed applications. If an application has an own web interface, you can reach it by using the application name link. Use the uninstall link in the list to uninstall an application. Here all new applications, application updates and application platform updates are installed. After uploading the file, the installation will start automatically and the installation process will be shown. The page refreshes until the installation has finished. Here you can view, download or clear the available log files from the application platform or from installed applications. You can also download all log files at once (this archiv also contains older versions from the log files). Enable/disable RPCAP for use with Wireshark. A link will be displayed, which you can use within Wireshark. Alarms from installed applications or the application platform itself will be sent to this configured server. Shutdown the application platform. You'll have to restart it over the IPxx10 gateway. Shutdown the application platform or reboot it. 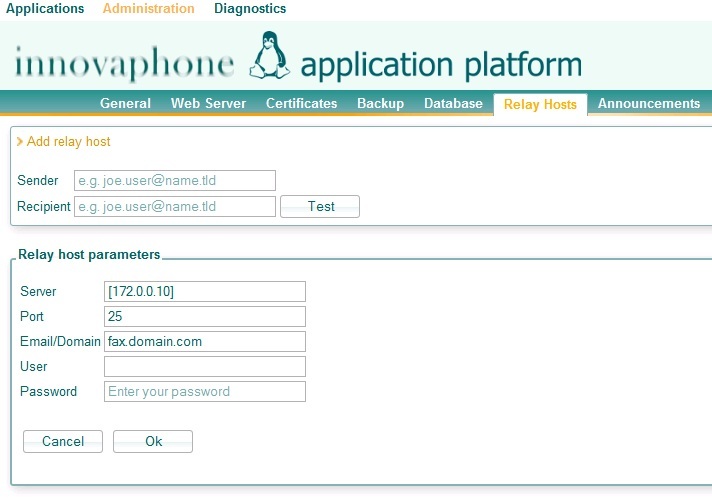 You can use the application platform as a server for innovaphone logs. So you can make the path /ap public on the Linux Web Server or you configure an authenticated URL for these files/this path on your innovaphone gateway. The log and alarm files will be saved unter http://LAP/webdav/log or /alarm. The files are rotated after 1 MB size and four times, so you'll have max 5 files. You can use the application platform as file server, e.g. for udpate scripts, voicemail etc. Public access to certain paths etc. can be configured under the web server configuration. Keep in mind that the Linux Filesystem(ext3) is case sensetive. The PBX will always search for lowercase letters. If you name your file ‘greetings.G711A’ it won’t be found. You have to name the file ‘greetings.g711a’. So currently all trace options are enabled with the level 255. Default trace level are "0"
WinSCP is a usefull webdav client, which can be used to access webdav of the innovaphone application platform. You're not running the latest kernel Image-6010-3.4.10! Take a look at our wiki to see, what you have to do now! To change to the new kernel, you have to reconfigure something on your device, where the CF card is plugged in. If you have configured an Alarm Server, you will receive certain alarms. The Linux application platform comes with the tested set of required Debian packages. It is not recommended to do a manual update of those packages (or the kernel itself). We have seen situations where updated packages had been changed in a non-downward compatible fashion - resulting in the applications running on the Linux application platform not working properly an more! If you configured a separate authentication, it depends on the used browser, whether you have to re-authenticate on switching between the root web and the innovaphone application web access or not. The installation of a new kernel fails and this process leaves the system unstable, not being able to install any more debian packages. Hotfix installations will probably fail. From time to time we will deliver upgraded debian packages with a new hotfix. As we have to insure compatibility with our applications, we won't perform an upgrade for each hotfix! Please do not perform an update/upgrade yourself, as this will break future hotfix/application releases. Sometimes we deliver debian packages in our hotfixes and dependencies might be broken if you update/upgrade yourself. I want to do it anyway!!! Perform these steps for each new hotfix release, as you might not be able to apply a new hotfix. Make a backup first and innovaphone won't be able to support manually upgraded installations! If you want an update to Debian 8 (jessie), you can do this via the command line interface (CLI). But there are a few steps necessary. 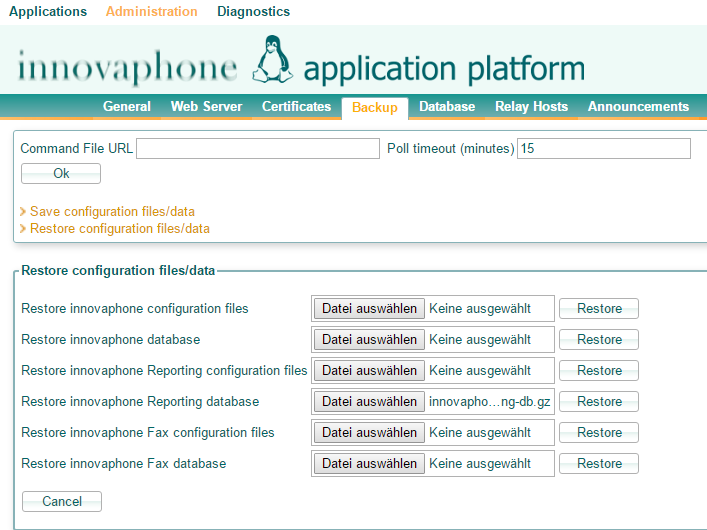 Install all innovaphone applications (Reporting, Faxserver, Exchange Calendar Connector) that should be run on the Linux Application Platform. Subsequently, no Innovaphone applications may be installed or uninstalled! Future Innovaphone Service Releases can not be installed after this step. Update the Linux Application Platform and all applications to the latest version (at least Service Release 53). 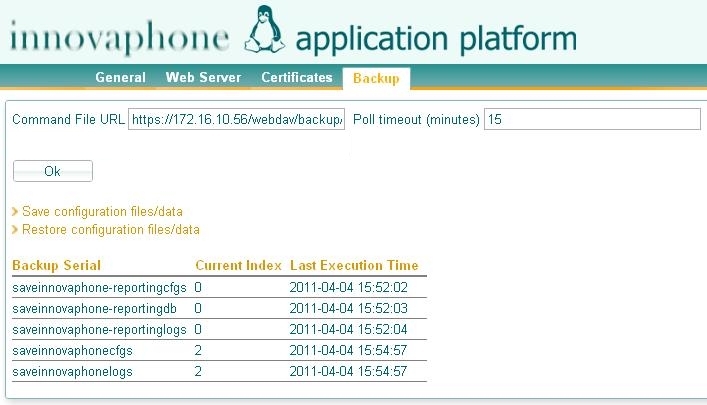 Make a Backup of the Linux Application Platform and all applications. Make sure, your Linux Application Platform has internet access. Login with a terminal client like Putty. Enter the Debian 8 (jessie) sources in the sources.list to perform the update. The following questions answer as follows. Restart the Linux Application Platform. Remove the paket php5-xcache, as the new PHP comes with an own opcode cache which creates conflicts. Disable php zend extension, which is now incompatible and restart the webserver. Apply unoconv patch wich comes with latest service release (requires Service Release 53). Important, you cannot upgrade the Linux Application Platform to Debian 9 (wheezy). (note the removed comment introducer at the beginning of the line). Please note that this will take 112MB more disk space on the LAP, so be sure you have enough. For more details on postgresql tuning, see https://wiki.postgresql.org/wiki/Tuning_Your_PostgreSQL_Server. Note that you may need to re-apply this change when you have installed a LAP update. The same can be done for application specific passwords, e.g. Reporting. When the installation process stuck either because it doesn't get IP or services are not refresh/finished there is some additional information we could get from the Compact Flash that could help us understanding what is failing and if necessary open a support ticket and include this information in the ticket to innovaphone. Stop the linux and check General->Compact Flash "Browse files". All files in there might be helpfull (all but the kernel, of course). Start the linux and check if you can connect to the configured/expected IP address via Putty after ~1 minute. Note: The file /var/log/init_install.log might help us to get a clue of the failure. The fastest way to get linux ap working with a new harddsik size is to install a new one. Is the linux ap after a restart running and over http reachable, download all the config and databases and restore them on the new linux ap (2.2). 2. In case the reason for the unreachable webgui was not a full harddisk you can save the config/database (only reporting and exchange connector at the moment) over the shell. 3. The steps mentioned above should be only the last try to get the data and could work or not. To be always on the save site use a standby Linux (for reporting), save configs (update server) and delete (automatic) old cdr's to avoid a full hd. This indicates a file system failure on the Linux Installation. When the Linux file system is broken, you can try to repair it using some command line Linux tools. This will run Linux on another (hopefully sane) partition. This will run Linux on the original partition. If this doesn't fix your issue, you need to replace the SSD with a new one, re-install the LAP and any applications and restore your backups. This page was last modified 07:20, 15 April 2019. This page has been accessed 163,378 times.